My husband starts a fire when he gets up (around 5 AM). I keep it going all day, gathering wood in the afternoons and bringing it into the garage, for easy access throughout the evening. In the late afternoon, as the sun is waning and the chill begins to set in outside, I stoke up the fire, turn on the ambient lighting in the room, and make the family room the coziest place in the house for the returning family. Most evenings, we eat dinner, in the glow of the firelight. More wood is added to the fire, for a cozy October evening with the family. This fireside living has turned a home-finance need into a desirable family gathering. I got lemons -- but I made lemonade! My garden club made these a couple of years ago. This is one of my favorite autumn decor pieces. I pull it out of the closet every October and place it in a new spot for the season. This year, it has become part of the ambient lighting in the family room. It's simply an empty wine bottle, with a string of mini white Christmas lights stuffed inside. 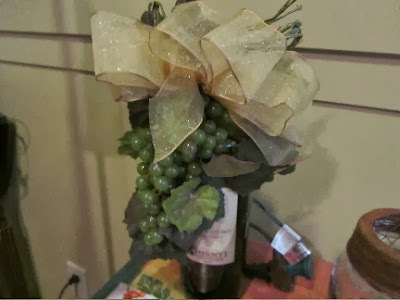 I, then, decorated the outside of the bottle with some faux grapes, grapevine and a bit of raffia. A gilded ribbon is tied onto the neck of the bottle as a crowning touch. 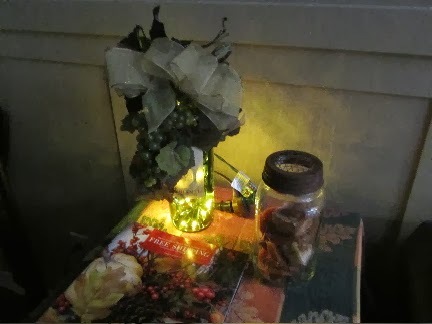 I have my lighted bottle on the side table (AKA a small filing cabinet covered in an autumn throw) next to the sofa. Two of our electrical outlets, in this room, are connected to a wall switch. I have the bottle plugged into one of these outlets, using an extension cord, so that I can easily switch this light on and off each evening. A simple touch that adds so much to our cozy evening enjoyment. Do you have any favorite autumn decorations for your home? Oh no! I hope this gov't shutdown doesn't last much longer! A furlough this time of year is awful! Maybe there are things that the two of you can do that you haven't had time for, like sealing up the house for winter, go apple picking together, and enjoy each other's company. At least you've had beautiful weather, and can put off turning on the furnace even longer. I'll be saying a prayer for your family. I seriously can't believe how steady your temperatures are between night and day! That just doesn't happen here! This time of year we've got 70's during the day and 40's or even high 30's at night. I can see why a fireplace wouldn't be a good idea for you! But your kitties sure would enjoy curling up in front of it! The maritime cloud layer keeps our temps fairly steady, Steadily cold that is. Yesterday was the worst, cold-wise, though. In the afternoon I was running errands and the outdoor temp was just in the upper 40s. But we're in for warmer days for the weekend. It is COLD there! I'm not ready for that yet. I have been reading your past blogs and was interested in your cost cutting efforts on your electric bill. I hope you don't mind me asking you a question about a past blog. My husband is under the impression that turning off the computer every night will add wear and tear to the computer resulting in having to purchase a new one more often. What are your thoughts? It is cold!! It was so bad this morning that I had to turn on the heat for an hour, so my kids wouldn't freeze while getting ready for classes and work. We're about 10 degrees cooler than normal for this time of year. I'm hoping the rest of fall and winter are better. Good question on the turning the computer off or not issue. My initial thought is there is probably some validity to your husband's thoughts. And as a computer is a pricey piece of equipment, it could make sense to keep it on and just put it into sleep mode when not using. I will ask my son (who majored in computer science) what he knows, when he comes home tonight. My own experience -- we had an old desktop several years ago. We turned it off after using every day. The thing was ancient by the time it did die. So turning it off might not have had an impact. Presently, I have a very old laptop, with a non-recharging battery (essentially a desktop at this point). I did unplug it this past summer, for one night. I had difficulty getting it to restart. Enough difficulty that I'm not willing to let it go unplugged (which is essentially "off" for this computer) ever again. 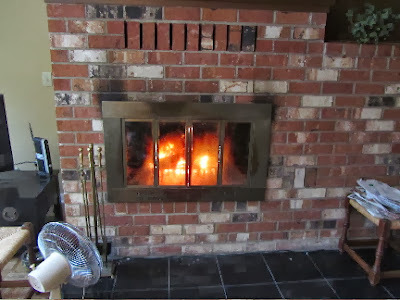 Even when the smoke goes well up the chimney, I always get a sore throat when we build a fire in the wood stove. Thus, we don't have them much any more. Oh, that's too bad! Building a fire probably has zero appeal to you, then. love this - so awesome. I just decorated for fall yesterday - lots of pumpkins, leaves and candles. your fall decor sound so warm and inviting! I am just now finding some really beautiful leaves on the ground. I'll have to bring some inside! The fire does look really cozy :) I would have liked one this past winter, but only at night. A fire just would not work well without a fireplace or stove, now would it! At least this next winter may be much different for you, heat-wise! Lili - your post alone made me feel cozy and cared for, and I bet that is how your family feels too! We are dealing with the federal shutdown too. Next week is going to be a good time to grocery shop my pantry. In times like these, I feel grateful that my frugality muscles are toned and strong. I didn't realize that the shutdown was impacting you, too. Everytime I turn on the news, I expect to see some progress, and still none! Best wishes getting through this tough time! I love the ambiance you've shared here! Sounds very warm and inviting. Thank you for sharing your fire. We have a 3 and 5 year-old and let them pick out some Spider Halloween lights yesterday. We budget for some kind of new decoration every year. I'm surprised how much fun and warmth a strand of lights adds to the room! Lots of our decorations are out now, and I just love looking at all of them and thinking of all the fun things we've done over the years. Your family must be really enjoying all the decorations. Those spider lights sound really fun! In years to come, your kids will remember being able to help choose them. I think that is half of the fun! A fire has the ablility to draw people to it, doesn't it?! Maybe not ipads with us, but I do find that we're spending more evening time together than we had during summer months. It sounds lovely ... though I'm not ready for temps in the mid-50s. We're having a warmer-than usual fall right now. We've bounced up into the upper 50s/low 60s for this week. But the evenings are still very, very cool. I've noticed frost on roofs in the neighborhood several mornings this past week. Brrrrr! I hope your warm fall weather is continuing!